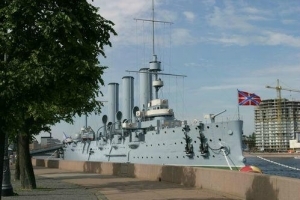 The Cruiser Aurora, moored at Petrovskaya Embankment, in front of the Naval School named after Admiral Pavel Nakhimov, is not only a monument to Russian shipbuilding, but also a symbol of the Soviet epoch. The cruiser was named in honor of the frigate Aurora, the one that heroically defended Petropavlovsk-Kamchatski city during the Crimean War of 1853-1856. The Cruiser Aurora was constructed in the New Admiralty shipyard in 1897. On May 11, 1900 the cruiser was launched, and in 1903 it joined Russian Navy. The cruiser underwent the baptism of fire during the Tsushima battle of the Russian-Japanese war. During World War I the Aurora participated in the military actions on the Baltic Sea. And at the end of 1916 she was put in docks for repairs. The Aurora played an important part in Russian history. The crew of the cruiser supported the Bolsheviks' party, and on 24-25 October (6-7 November, new style) the Aurora took part in the armed rising that led to great political changes in Russia. At 21.40 Moscow time the gun of the cruiser Aurora gave the blank shot. It was the signal to start the assault of the Winter Palace. As a result of the historical assault, the Provisional Government was arrested, and the Bolsheviks' party got the power. It was the beginning of the new era in Russian history.In the Soviet period the Cruiser Aurora became the training ship for the cadets of naval schools. During World War II the cruiser, berthed in the Gulf of Finland near Oranienbaum, defended Leningrad. The battleship was badly damaged, and in 1944 the Cruiser Aurora was towed to Leningrad for major repairs. For some time she was used as a training ship for the cadets of the Naval School named after admiral Pavel Nakhimov. In 1952 the cruiser was turned into the Ship Museum, which became the branch of the Central Naval Museum. In 1992 the Saint Andrew Naval Banner raised over the Cruiser Aurora. The Aurora exposition features over 500 original documents, photographs, and ship objects concerning the cruiser's history and its participation in Russian history. For those who wish there are thematic excursions of the underwater cruiser part and machine-boiler sector.